There were several groups of people (Wildlife Care Center, Grateful Paws, Animal Control and several individuals...) involved in the rescue of Lani; the dog who was living beneath a vacant house on SW 4th Avenue where it intersects with State Road 84. Calls and concerns were coming from 4 different directions, and individually, everyone contacted Grateful Paws.- And through a united effort and a love for animals, were able to catch her. Lani was adopted almost immediately after capture by a family who was friends of one of her rescuers. 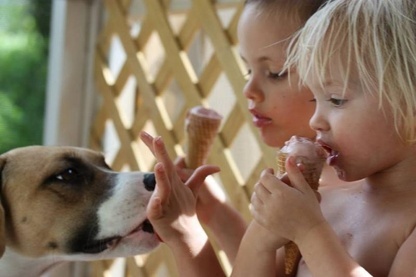 And here she is 8 months later, just hoping one of her little human sisters will lick that ice cream right out of that cone! "please, please, please... lick a little harder!" Life is good. Little Lacee was rescued as a Good Samaritan saw her in distress, appeared to be giving birth and in much pain. Rushed her to the vet, and they determined she was not in labor, but rather that she had had several (didn’t even begin to know how many) litters that her bladder and other parts were plain old worn out. Her abdomen was filled with fluid and she was totally emaciated with her ribs and backbone sticking out of her sparse coat. She spent days in the hospital recovering from surgery and weakness, all the while having a great disposition. After going into foster home and getting love and attention, she began to show signs of improvement, and even wagged her tail! 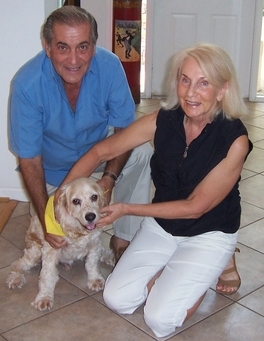 After several months, Lacee made a full recovery and was adopted by her wonderful new family. She had a very rough road but was determined to make it. Lacee probably would have died within a day or so had she not been immediately taken to the vet. BAILEY: Bailey the cocker was raised from puppyhood by a loving and caring owner; inseparable best buddies. Twelve years later, his owner was diagnosed with Alzheimer’s and went into a nursing home and sadly, arrangements were not made for Bailey. Because of his wonderful temperament, Bailey was quickly adopted and placed in a loving home with two younger cockers, but his new mom lost her job, her house and husband, so per our adoption contract, Bailey came back into our care. He is in excellent health with what we call selective hearing (can ONLY hear the squeak of a cupboard door). In the meantime, we have given him a dental, removed a couple fatty tumors from his neck and belly, and have treated him for those notorious Cocker ears. Because of his age, he remained in our care for about a year --- food, HeartGard, Frontline every month… plus all the vet visits he required. Many dollars later, we are delighted to report that Bailey has been adopted by the Peter and Shirley Mercurio family in Margate. They are delighted at their new addition and we are delighted that Bailey, a great little fella, has found his new forever home. The fella was found horribly matted, blinded, ill, and wandering into traffic. He is a medium sized shaggy dog – one eye was horribly infected and swollen shut --- the other eye sunken in, technically blind. He had a growth on each side of his mouth, one was dangling and the other had already burst and was badly infected. Each ear had an infection so bad, they were oozing. And, he had not been neutered! 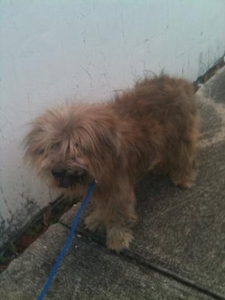 His coat was so badly matted it was pulling on his skin and sores had developed. I guess if you were to look at the overall picture, this was a dog that should be humanely put to sleep, in fact, the intern who first saw him, recommended that to me. But… individually -- each malady was treatable. Thank goodness Dr. Grasso felt the same way we did. He was shaved to the skin – and the necessary surgeries were performed – and with all the stitches, came home looking like Frankenstein! As his coat grew back we determined that he is a soft-coated Wheaten Terrier and one of the best dogs we have ever had in our care. 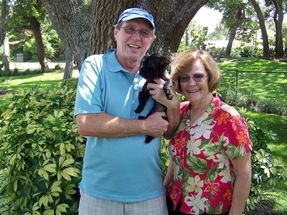 In July 2010, his foster mom Tove’ decided that she didn’t want to part with him, so she adopted him. His vet bill was almost $1,500. He is happy and healthy, and one of the best dogs we have ever saved. Scooter is a 4 lb. 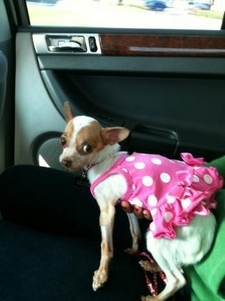 Chihuahua who was dumped in one of the nicer neighborhoods in Fort Lauderdale. 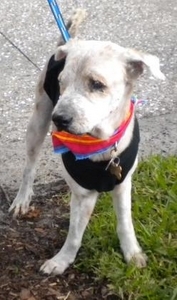 She was picked up by Tamara and Mimi, who just couldn’t leave her on the streets. 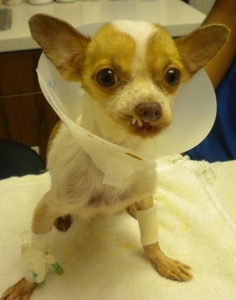 In addition to her being flea-ridden and malnourished, she had an injury to her mouth that left her mouth in a perpetual sneer; part of her top lip was gone and her front teeth were exposed. At first we thought it was a cleft-palate, but now we are pretty sure it was trauma, most likely, the result of her biting into an electrical cord. The teeth were black, loose and deadened. Between the pain and the raging infection that had spread into her jawbone, this was one very sick little lady who could not eat. After about ten months of TLC with Dr. Zapata from VCA Hollywood Animal Hospital, she has finally been released from care. Dr. Z. treated the infection, removed her deadened teeth and with good food, some antibiotics and lots of TLC, blossomed overnight. She has since been adopted, has been renamed Lulu and is living a great life with Gary and Dee Hellkamp. BTW: Lulu is queen of her roost and daddy’s little girl. 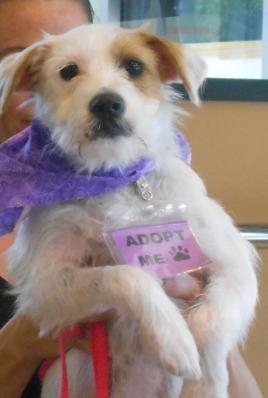 Leesha Grace is a one-year old, wire haired JRT mix with a shattered leg. She was stuffed into the night box at the Wildlife Care Center. Amputation was in order, until we got her into a foster home where she started playing with her foster brother. Once she started using that leg, she started building muscle tissue, so amputation was no longer a consideration! Sure, she will always have a limp, but she still has all four! 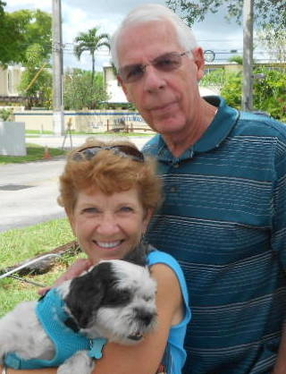 Between her vetting, the kennel cough, the UTI and x-rays, her Vet bill was in excess of $900 Delighted to report that she was adopted by Barbara and Skip Hawkes.